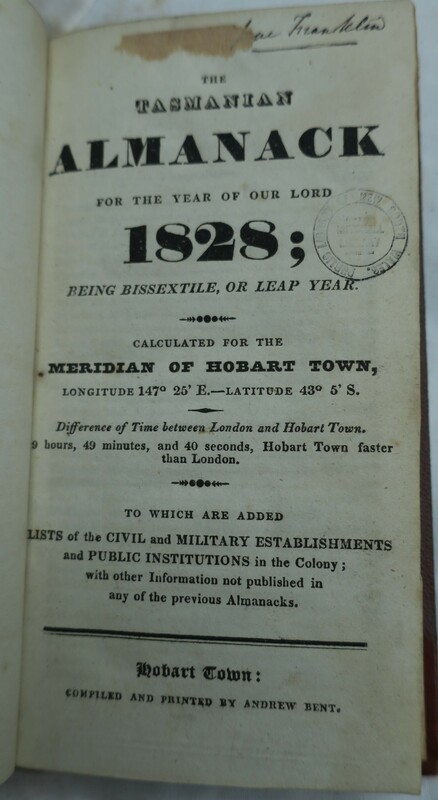 The Tasmanian Almanack for the Year of our Lord 1828; being Bissextile, or Leap Year. Calculated for the Meridian of Hobart Town, Longitude 147° 25′ E.—Latitude 43° 50’ S. Difference of Time between London and Hobart Town, 9 hours, 49 minutes, and 40 seconds, Hobart Town faster than London. To which are added Lists of the Civil and Military Establishments and Public Institutions in the Colony; with other Information not published in any of the previous Almanacks. Hobart Town: Compiled and printed by Andrew Bent. 118 p. demy 12mo in sixes (Wilson) pages 17.9 x 9.5 cm, approx. Paper water marked Harris and McMurdo 1823. 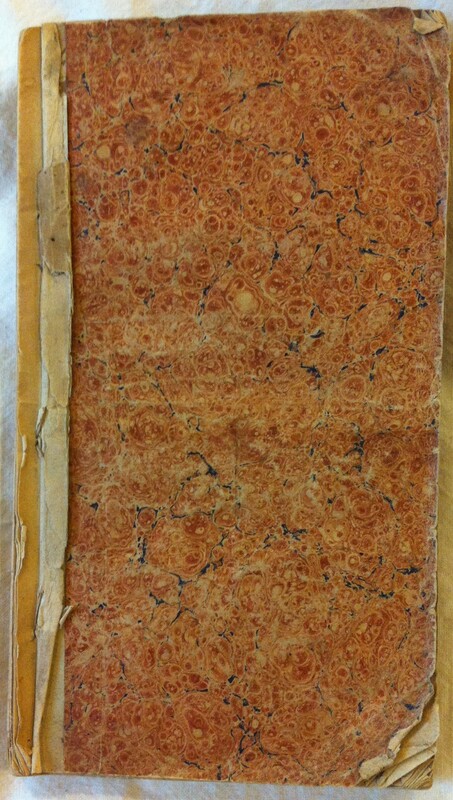 Marbled paper or blue wrappers. Advertised as ‘now publishing’ 4 Jan. 1828. Price 5 shillings. 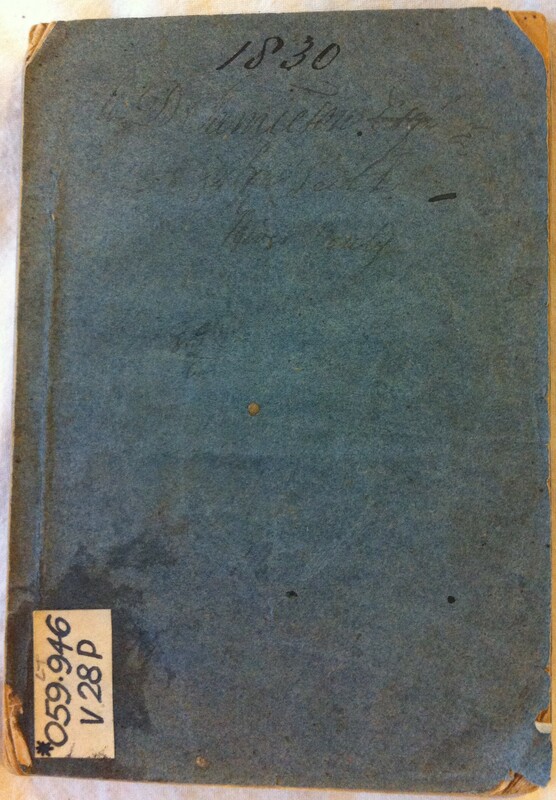 The ML copy shown is inscribed by Jane Franklin and is possibly from the ‘books and papers’ given to the Franklins by Bent soon after their arrival in Hobart Town in 1837. Advertised CT 12 Dec. 1828: Now publishing. Price one shilling’ Ferguson 1243. No copies. 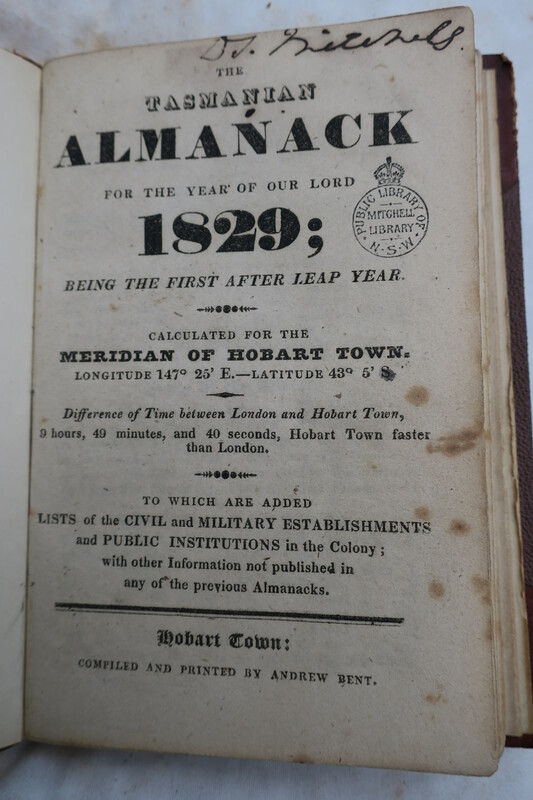 The Tasmanian Almanack for the Year of our Lord 1829; being the first after Leap Year. Calculated for the Meridian of Hobart Town, Longitude 147° 25′ E.—Latitude 43° 50’ S. Difference of Time between London and Hobart Town, 9 hours, 49 minutes, and 40 seconds, Hobart Town faster than London. To which are added Lists of the Civil and Military Establishments and Public Institutions in the Colony; with other Information not published in any of the previous Almanacks. Hobart Town: Compiled and printed by Andrew Bent. 174,  p., Cr. 8vo. (Wilson) pages 15 x 11 cm. approx. Blue covers. Has a useful chronology of the colony p. 73-176. Some copies overprinted on last page: Colonial Times, as a News-paper, REVIVED.-Jan. 2, 1829. Advertised (HTC 13 Dec. 1828) as ready for publication in the ensuing week at the very moderate price of 3s. 6d. for ready money, or with a Sheet Almanack for one Spanish Dollar. When Bent learnt that the act imposing a licence on newspaper was repealed he offered all the subscribers, supporters and advertisers of the Colonial Times a copy of the almanack as a New Year’s gift (CT 26 Dec. 1828). On 7 May 1824 Bent advertised he intended to reprint Michael Howe but there is no evidence that he did. Early in 1828 he wanted to borrow a copy of the little book, seemingly not having one still in his own possession (CT 18 Jan. 1828). On 5 Dec. 1828 a reprint, or second edition, was advertised as ‘in the press.’ To be published 1 Jan. 1829. Price 2s. 6d. An extract from the new preface appeared in the advertisements on 19 and 26 Dec. On 2 Jan. 1829 the pamphlet was still ‘about to be published.’ No further advertisements appeared in Hobart but some copies must have been printed because on 10 Feb. 1829 the Australian newspaper in Sydney noted that it had been furnished with a copy, together with Bent’s 1829 Almanack. 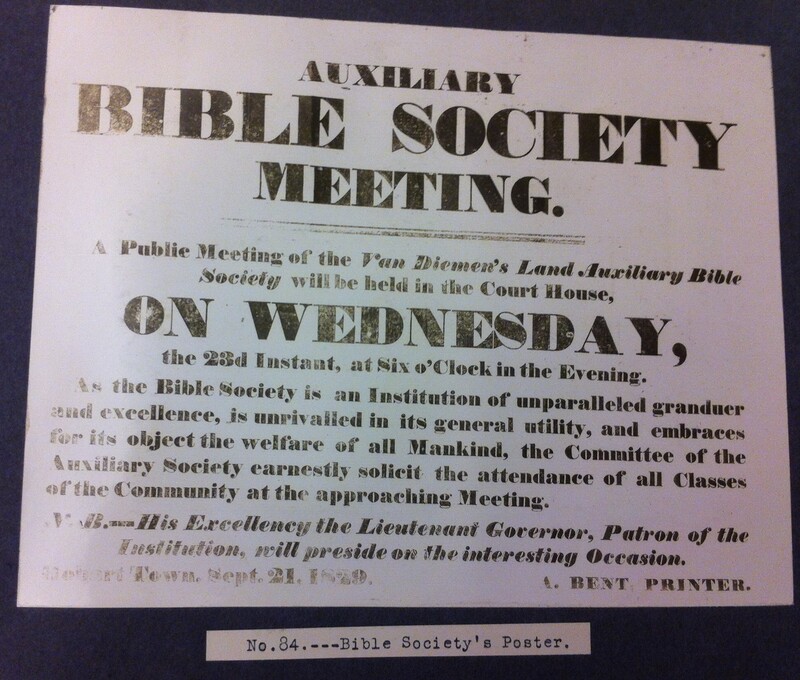 Auxiliary Bible Society Meeting [notice of a meeting to be held at the Court House 23 Sep. 1829] Hobart Town, Sept. 21, 1829. A. Bent, Printer. Broadside, 36.4 x 45 cm. 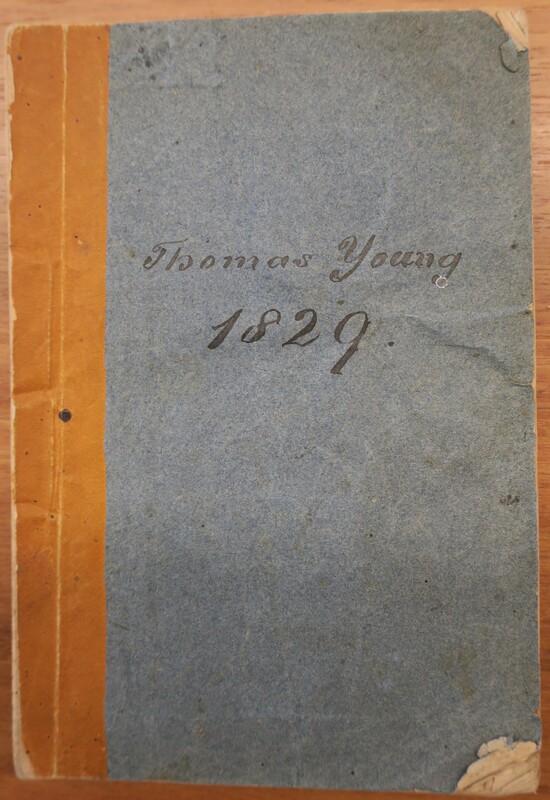 Ferguson notes a copy held by Tasmanian Auxiliary of the British and Foreign Bible Society (not sighted). Photograph no. 84 in: Beattie, John Watt. Historical photographs relating to Tasmania. 1912. Reproduced in the Mercury 9 Aug. 1929, p. 10. Advertised as available, 1 shilling each CT 1 Jan. 1830. No copies. 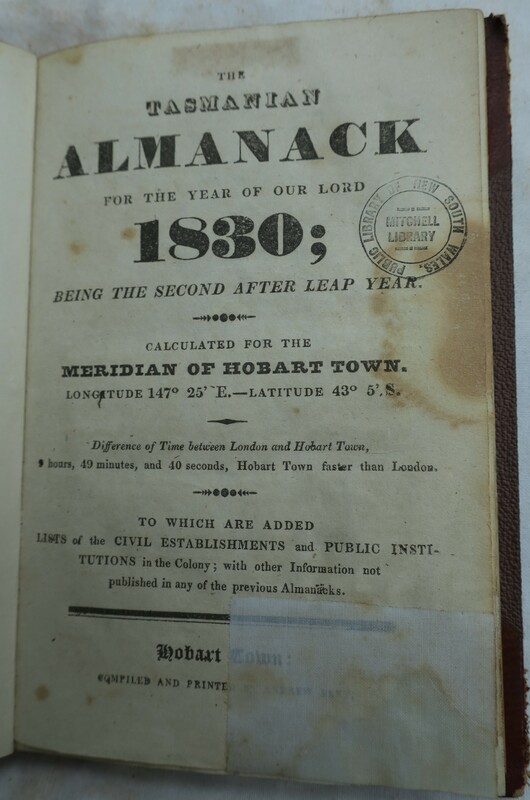 The Tasmanian Almanack for the Year of our Lord 1830; being the second after Leap Year. Calculated for the Meridian of Hobart Town, Longitude 147° 25′ E.—Latitude 43° 50’ S. Difference of Time between London and Hobart Town, 9 hours, 49 minutes, and 40 seconds, Hobart Town faster than London. To which are added Lists of the Civil and Military Establishments and Public Institutions in the Colony; with other Information not published in any of the previous Almanacks. Hobart Town: Compiled and printed by Andrew Bent. 72 p., Foolscap 8vo in fours (Wilson) pages 15 x 10 cm. approx. Plain blue paper covers. Published 4 Jan. 1830. Price 3s 6d. to Subscribers; non-Subscribers, 5s. With his business in dire straits, Bent cut corners by printing on flimsy paper in tiny fonts. The section on colonial gardening is almost impossible to read. This last almanack is the least attractive and also the rarest of the seven almanacks published by Bent. Savery, Henry. 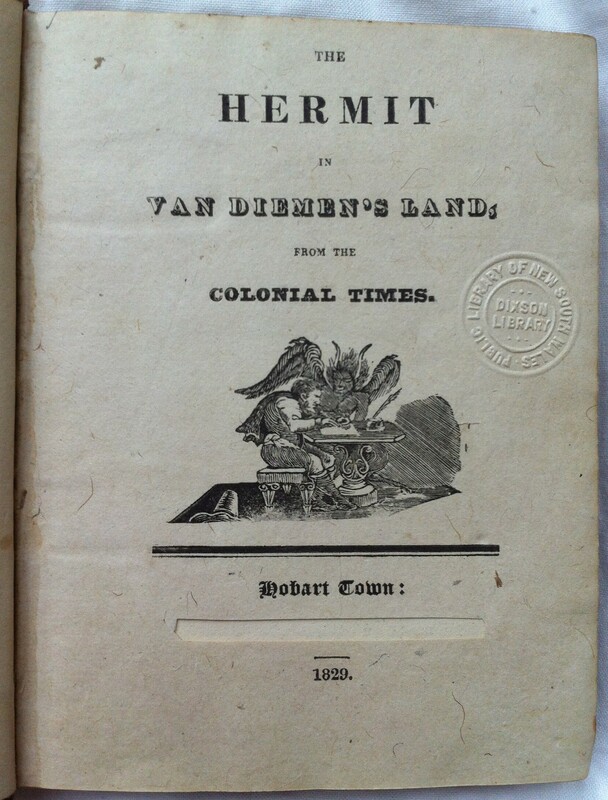 The Hermit in Van Diemen’s Land, from the Colonial Times. Hobart Town: Printed by Andrew Bent, Elizabeth-street. 1829. 154 p., 15 x 11 cm. A reprint in book form of the weekly satirical sketches by ‘Simon Stukeley’ which caused a sensation when they first appeared in Bent’s Colonial Times from 5 June to 25 Dec. 1829. Henry Melville (who would have known) identified the author as convict writer Henry Savery (annotation in BL copy) and stated that Thomas Wells only copied for the printer. Wells and Savery were both incarcerated for debt at the time of writing and there was possibly a good deal of collusion between them. Other authors or collaborators were suggested both contemporaneously and later, including Dr. William Crowther, James Grant and Howard David Sarel. Publication was intended for 1 Jan. 1830 (first advertised CT 16 Oct 1829). On 1 Jan. the work was advertised as ‘in the press’ and shortly to be published, with only a few copies not already spoken for. On 15 Jan. publication was suspended until a libel action against the printer had been disposed of. The prosecutor was lawyer Gamaliel Butler who had been rather unkindly dealt with by the anonymous Hermit as well as elsewhere in the Colonial Times. Bent had to pay damages of £70. Hugh Ross also brought an action against Bent for libeling him in the Hermit but this was postponed because an important witness was absent from the colony. Of the nine known surviving copies four have been mutilated, in various ways, to remove the printer’s name from the title page and colophon (FC, ML, DC copy at SAFE 82/165 and one of the VSL copies) and in another the title page and last few pages are missing. Some copies have been extensively annotated with keys to the persons portrayed and/or additional notes about the authorship. There is a pen-portrait of Bent (the Hermit’s indefatigable friend and ‘second Franklin’) riding about on his farm on p. 141. The artist of the vignette on the t.p. has not been identified. It is possible that the seated figure on the left is a caricature of the ‘awkwardly made’ Andrew Bent. If so, it is the only surviving image of him. Bent later reused this woodcut for a series of articles on the theatre entitled ‘The prompter and dramatic censor) in BN 1837. FC copy is available in a digitised version.